BOOMTOWN is an 1880s themed three-day arts, eco-education, and vintage perfomer event. 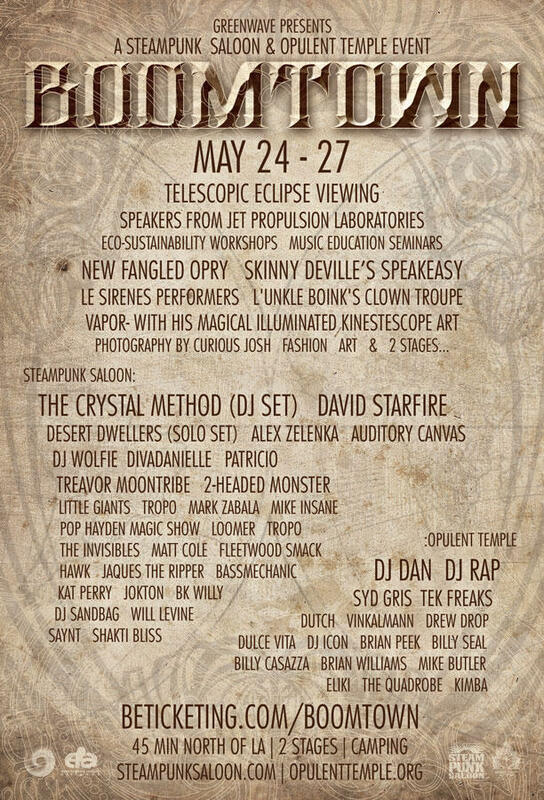 The campout will host science lectures, sustainable living displays and classes, a narrated lunar eclipse viewing, handmade clothing creators, and vintage performers, including magicians and vaudeville acts. An 1880s Tent. Inside is a 70-year-old bar tender, dressed in steampunk clothes. He serves root beer and lemonade. To the left is the cabinet of curiosities - glittery treasures from all parts of the world. A saber tooth tiger skull, maps to forgotten lands, writing desks, quill pens, brass telescopes. And many other acoustic and performance acts. This area will be a 20' dome next to the Museum of Extraordinary Wonder. The Green Grotto will feature displays of tower gardens, recycling techniques, composting techniques, books on urban gardening, apartment gardening, and many displays. Lecturers will speak of communal village gardens, modern ecological events, sustainable living Q & As, and outreach programs that Green Wave promotes and supports around the globe. The Opulent Temple creates a playground for connection with the Eternal through music. This stage features a Jules Verne inspired metal pod with small fire effects that serves as the stage for musicians. There will also be other forms of light art and metal sculpture to enjoy. At the center of the Opulent Temple, community experience is the concept of a "Master Class". World class musicians who remember their early roots are invited to perform. These musicians have writen their own music and will give lectures during the day on modern computer composition techniques. At night, they will entertain the dancers with their music. Select people from the daytime lectures will be invited up into the music capsule to watch the performers work their midi controllers and laptops. MAKERS MARKET - This area features handcrafted 1880s apparel, jewelry, top hats, women's ballroom gowns, and period props. Every vendor hand makes their own wares. This area creates a community of grass roots vendors. By bringing all of these small buisness creators together and placing them in a marketplace at a festival that features 1880s style fashion, we will be supporting their beautiful art. After years of small gatherings, we have a vision to bring all of these similar groups together and let the steampunk musicians mix with the astronomers, the rocket scientists, and the eco-awareness educators. We are very excited to bring our steampunk community together. We feel deeply in our hearts that this event will fulfill a greater purpose than just a weekend campout. This weekend will serve to educate, to illuminate, to include people with diverse ideas, and to see the spark of new possibilites for the earth, for fashion, and for music light up in the eyes of our attendees.